HYPONATREMIA IS COMMON IN BOTH INPATIENTS and outpatients. 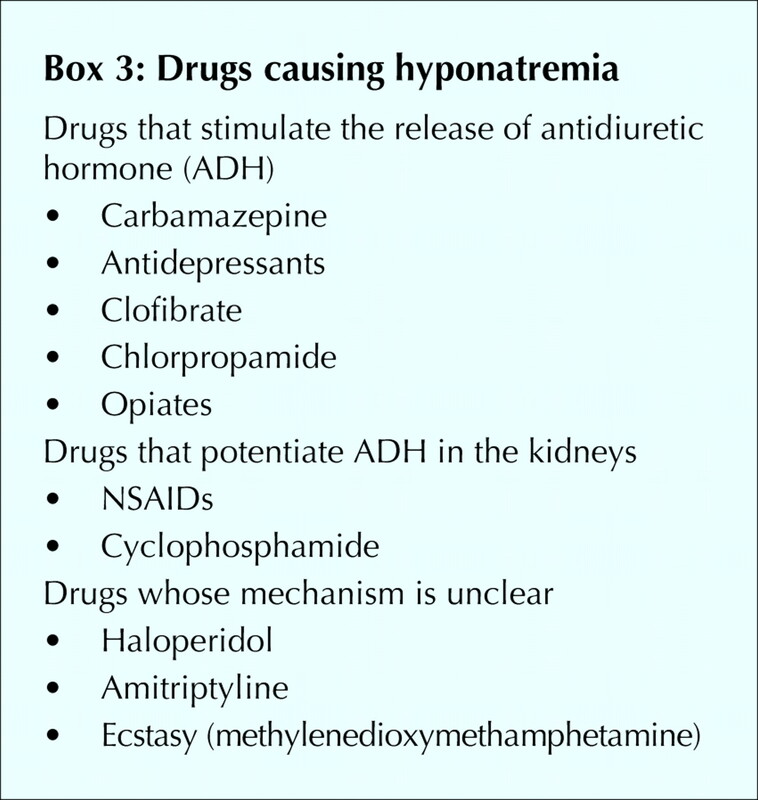 Medications are often the cause of acute or chronic hyponatremia. Measuring the serum osmolality, urine sodium concentration and urine osmolality will help differentiate among the possible causes. Hyponatremia in the physical states of extracellular fluid (ECF) volume contraction and expansion can be easy to diagnose but often proves difficult to manage. 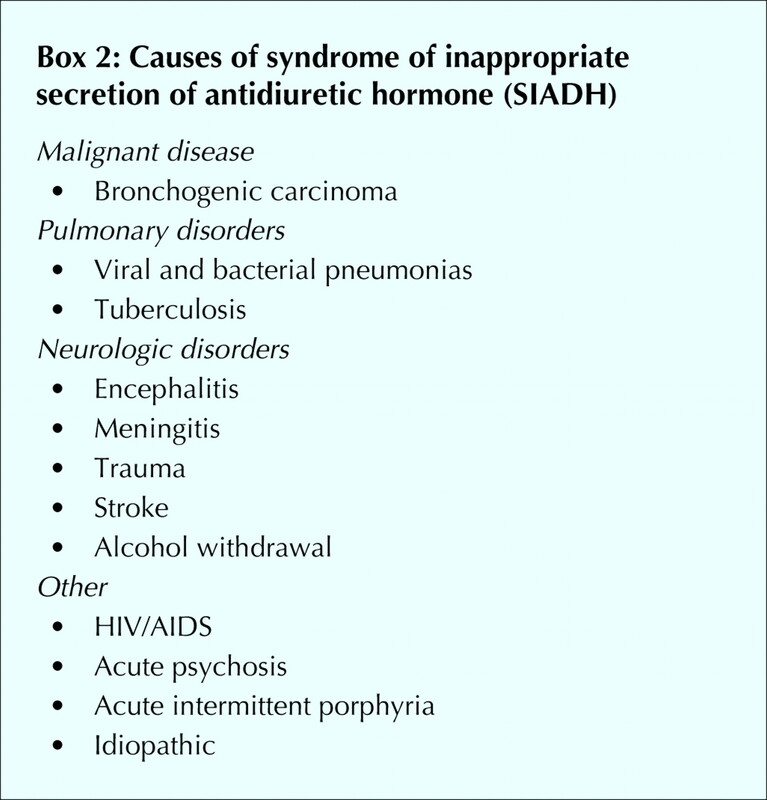 In patients with these states or with normal or near-normal ECF volume, the syndrome of inappropriate secretion of antidiuretic hormone is a diagnosis of exclusion, requiring a thorough search for all other possible causes. Hyponatremia should be corrected at a rate similar to that at which it developed. When symptoms are mild, hyponatremia should be managed conservatively, with therapy aimed at removing the offending cause. When symptoms are severe, therapy should be aimed at more aggressive correction of the serum sodium concentration, typically with intravenous therapy in the inpatient setting. A 72-year-old woman presents to your office with a 2-day history of presyncope when rising from a chair. She has been taking hydrochlorothiazide, 25 mg/d, for 5 years for systolic hypertension. Over the last week she has had a bout of viral gastroenteritis with marked diarrhea. She has been trying to replace the lost fluids by drinking 2–3 L of water per day. You determine that when she rises from a seated position, her blood pressure drops 20 mm Hg; her jugular venous pressure is low. Serum levels are as follows: sodium 128 mmol/L, potassium 3.1 mmol/L, creatinine 125 mmol/L and urea nitrogen 10 mmol/L. What is your approach to this woman's hyponatremia? 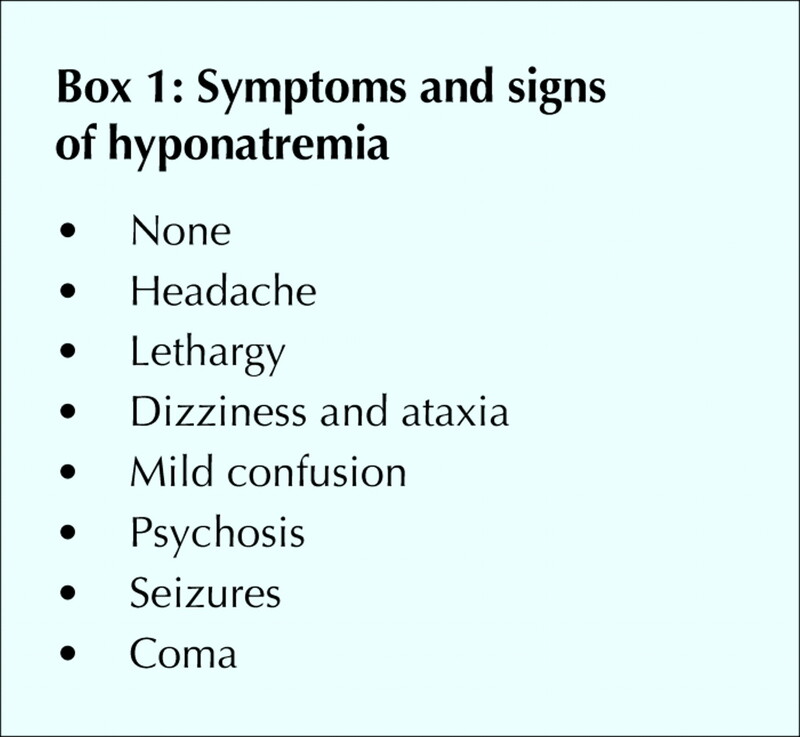 The symptoms and signs of hyponatremia vary from subtle to extreme; none is specific (Box 1). The diagnosis is confirmed by laboratory findings. Hyponatremia is typically defined as a serum sodium concentration of less than 134 mmol/L. In the past, hyponatremia was often diagnosed erroneously when the patient had high levels of serum lipids or plasma proteins. This should no longer be a concern because of the sodium electrode method used in almost every centre in Canada. In addition, hyponatremia occurs, but is not usually symptomatic, when the serum osmolality is elevated by severe hyperglycemia or mannitol infusion. The lowered serum sodium concentration is due to dilution by osmotic shifts of water out of cells. In these cases, the high serum osmolality will help to differentiate these causes from other “true” causes. “True” hyponatremia occurs when the serum osmolality or tonicity is decreased. For this defect to occur, there has to be some inability of the body to excrete free water through the kidneys despite continued water intake. This can occur in the following 3 settings (Table 1). In the setting of hyponatremia and clinically normal or near-normal ECF volume, ADH release or renal tubular responsiveness to ADH may be unrelated to serum tonicity or ECF volume contraction. In these situations, the patient is said to have the syndrome of inappropriate secretion of ADH (SIADH) or “a reset osmostat”.3,6,7,8,9,10 In SIADH, the serum sodium concentration falls as the kidneys inappropriately retain free water. The patient's normal amount of body sodium is functionally diluted by the retained water. The patient appears to have a normal ECF volume or mild ECF volume overload (“near normal”). The urine sodium concentration is typically greater than 40 mmol/L. Two other potential causes of hyponatremia in patients with normal or near-normal ECF volume are hypothyroidism and adrenal insufficiency. A diagnosis of SIADH can be made only when these conditions have been ruled out by appropriate tests (e.g., determining the serum concentration of thyroid stimulating hormone or performing the cortisol stimulation test) and cannot be made when the patient has renal failure or an abnormal ECF volume. The cause of this type of hyponatremia is usually easy to identify. Edema-producing states, such as chronic congestive heart failure, cirrhosis and nephrotic syndrome, can all cause hyponatremia. 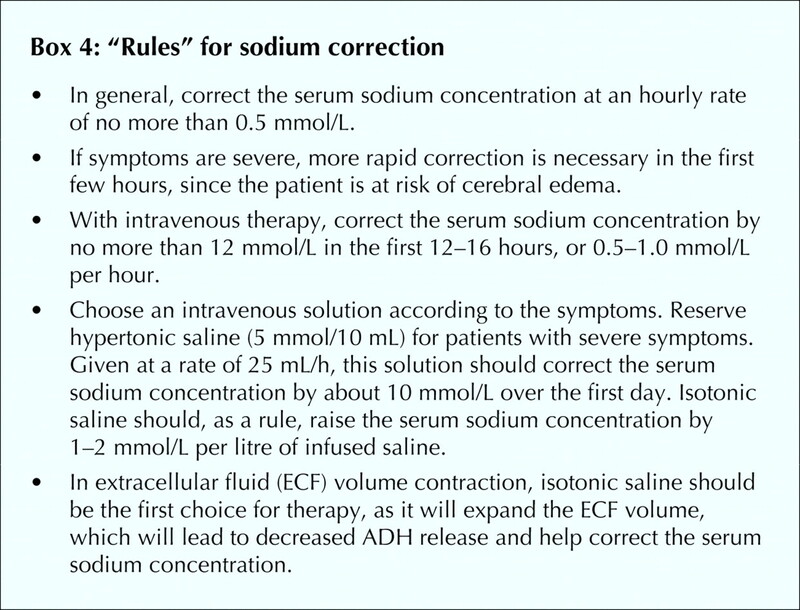 The patients have an ECF volume overload and an elevated body content of sodium and water but, by definition, have more water relative to sodium. However, these patients often have a low effective circulating volume and poor renal perfusion. Because the kidney does not distinguish between a low effective circulating volume and ECF volume contraction, it will avidly retain sodium and water, which leads to edema. The urine sodium concentration is usually less than 20 mmol/L but may be higher if the patient is receiving diuretic therapy. These patients may also have ECF volume contraction from correctible causes and may respond to a gentle oral challenge of isotonic salt and water. Nephrotic syndrome can be ruled out by testing a urine sample and a 24-hour urine collection for protein; the 24-hour amount will be greater than 3.0 g in nephrotic syndrome. Rarely, in the outpatient setting, a patient will present with hyponatremia secondary to psychogenic polydipsia. Typically seen in patients with schizophrenia or other psychiatric diseases, this disorder is due to ingestion of large volumes of water (> 20 L) over a short period. The hyponatremia, which can cause confusion or seizures, develops temporarily and resolves quickly as the kidneys work to excrete the excessive free water.4,5,7 The urine is dilute (osmolality < 100 mOsm/L), as is the serum (normal range, 280–295 mOsm/L). The key to effective management of hyponatremia is establishing the type and its cause, so that the cause can be removed, if possible, and the management will be appropriate. Paramount is clarifying whether the hyponatremia has developed quickly (over a few days) and is acute or whether it has developed over days to weeks and is chronic. The rapidity of correction of the serum sodium concentration should be closely linked to the suspected time over which the hyponatremia has developed. The management of hyponatremia in patients with hypervolemia can be difficult. Water restriction to less than 1.25 L/d is essential. Sodium restriction to 70 mmol/d (with the aid of a dietitian) will help with edema. A loop diuretic should be used to promote sodium and water excretion by the kidneys. In both congestive heart failure and cirrhosis, the addition of a potassium-sparing diuretic is useful to prevent hypokalemia and lessen edema (and ascites). Referral to a cardiologist or hepatologist may be necessary in cases of refractory heart failure or cirrhotic ascites. Patients with nephrotic syndrome should be referred to a nephrologist, as specific therapies (e.g., with corticosteroids and immunosuppressive drugs) may be directed at the cause of their disease and reduce proteinuria. Fig. 1 presents a suggested management algorithm. Fig. 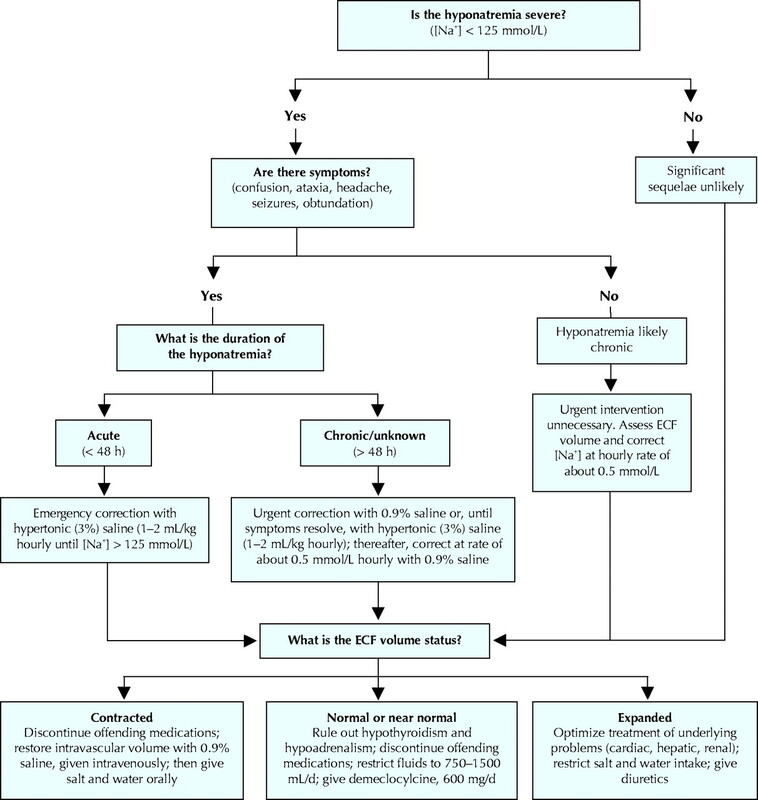 1: Algorithm for the recommended management of hyponatremia. [Na + ] = serum sodium concentration; ECF = extracellular fluid. The patient has clinical signs of ECF volume contraction. The most likely cause is gastrointestinal losses of salt and water, with only water replacement. It is also likely that the thiazide diuretic is contributing to the hyponatremia. Thiazides impair the kidney's ability to produce a dilute urine.19 Both thiazides and loop diuretics (e.g., furosemide) impair the kidney's ability to reabsorb sodium, but thiazides also impair free water excretion.24,25 With continued fluid intake and impaired excretion of water, hyponatremia can develop rapidly. The ECF volume contraction, diarrheal losses and diuretic use have also resulted in hypokalemia in this patient. As ECF volume contraction develops, the kidneys actively excrete potassium in exchange for sodium in an attempt to preserve ECF volume. Another factor potentially contributing to this patient's hyponatremia may be the “tea and toast” phenomenon. In elderly patients with a diet poor in protein and sodium, hyponatremia may be worsened by their low solute intake. The kidney's need to excrete solutes aids in water excretion. An increase in dietary protein and salt can help improve water excretion. By a mechanism similar to that in the “tea and toast” phenomenon, hyponatremia can occur with excessive beer drinking, although this was unlikely in our patient. “Beer-drinker's potomania” is caused by a beer “diet” that is high in fluid but low in solute. In both situations, a 24-hour urine collection will reveal a solute excretion of less than 500 mOsm/d. The management of our patient should include temporary discontinuation of the thiazide diuretic. Although her hyponatremia has developed over about a week, she has clear evidence of ECF volume contraction. Volume restoration with normal saline and potassium replacement is required until the postural drop in blood pressure is less than 10 mm Hg. She should then be treated conservatively with oral sodium and potassium replacement. She should be reassessed frequently to ensure improvement. An alternative medication should be sought to treat her systolic hypertension.26 If the thiazide diuretic is to be reintroduced, measurement of the serum electrolyte concentrations should be undertaken 5–7 days later to ensure that hyponatremia has not recurred. Contributors: Dr. Yeates was the principal author and revised and prepared the final version. Dr. Morton assisted in redesigning the algorithms and boxes. Drs. Morton and Singer critically reviewed and revised the article for important intellectual content. All authors approved the version to be published. Haralampos J, Milionis GL, Elisaf MS. The hyponatremic patient: a systematic approach to laboratory diagnosis [review]. CMAJ 2002;166(8):1056-62. Palmer BF. Hyponatremia in neurosurgical patients: syndrome of inappropriate antidiuretic hormone versus cerebral salt wasting. Nephrol Dial Transplant 2000;15:262-8. Kahn T. Reset osmostat and salt and water retention in the course of severe hyponatremia. Medicine (Baltimore) 2003;82:170-6. Halperin M, Goldstein M. Fluid, electrolyte and acid-base physiology: a problem based approach. 3rd ed. Philadelphia: WB Saunders Company; 1998. Preston R. Acid-base, fluids and electrolytes made ridiculously simple. Miami: Medmaster; 1997. Adrogue HJ, Madias NE, Hyponatremia. N Engl J Med 2000;342:1581-86. Chung HM, Kluge R, Schrier R. Clinical assessment of extracellular fluid volume in hyponatremia. Am J Med 1987;83:905-8. Anderson RJ. Hospital associated hyponatremia. Kidney Int 1986;29:1237-47. Sterns RH, Cappuccio JD, Silver SM, Cohen EP. Neurologic sequelae after treatment of severe hyponatremia: A multicenter perspective. J Am Soc Nephrol 1994;4:1522-30. Sterns RH, Thomas DJ, Herndon RM. Brain dehydration and neurologic deterioration after correction of hyponatremia. Kidney Int 1989;35:69-75. Berl T. Treating hyponatremia: Damned if we do and damned if we don't [review]. Kidney Int 1990;37:1006-18. Laureno R, Karp BI. Myelinolysis after correction of hyponatremia. Ann Intern Med 1997;126:57-62. Holden R, Jackson MA. Near-fatal hyponatremic coma due to vasopressin over-secretion after “ecstasy” (3,4-MDMA). Lancet 1996;347:1052-3. Ayus JC, Arieff AI. Chronic hyponatremic encephalopathy in postmenopausal women: association of therapies with morbidity and mortality. JAMA 1999; 281:2299-304. Strange K. Regulation of solute and water balance and cell volume in the central nervous system. J Am Soc Nephrol 1992;3:12-27. Ellis SJ. Severe hyponatremia: complications and treatment. Q J Med 1995; 88:905-9. Ayus JC, Wheeler JM, Arief AI. Postoperative hyponatremia encephalopathy in menstruant women. Ann Intern Med 1992;117:891-7. Forrest JN, Cox M, Hong C, et al. Superiority of demeclocycline over lithium in the treatment of chronic syndrome of inappropriate secretion of antidiuretic hormone. N Engl J Med 1978;298:173-81. Arieff AI. Hyponatremia, convulsions, respiratory arrest, and permanent brain damage after elective surgery in healthy women. N Engl J Med 1986;314: 1529-40. Sterns RH. The management of symptomatic hyponatremia. Semin Nephrol 1990;10:503-14. Sterns RH. The treatment of hyponatremia: First do no harm. Am J Med 1990;88:557-60. Lien YH, Shapiro JI, Chan L. Study of brain electrolytes and osmolytes during correction of chronic hyponatremia. Implications for the pathogenesis of central pontine myelinolysis. J Clin Invest 1991;88:303-9. Friedman E, Shadel M, Hallan H, Fardel Z. Thiazide induced hyponatremia. Reproducibility by single-dose challenge and analysis of pathogenesis. Ann Intern Med 1989;110:24-9. Clark BA, Shannon RP, Rosa RM, Epstein FH. Increased susceptibility to thiazide induced hyponatremia in the elderly. J Am Soc Nephrol 1994;5: 1106-11. Campbell NRC, Drouin D, Feldman RD; Canadian Hypertension Recommendations Working Group. The 2001 Canadian hypertension recommendations: take-home messages [erratum in CMAJ 2002;167(9):989]. CMAJ 2002;167(6):661-8.